I needed some new foundation and got a bit carried away and decided to buy some primer also. I’ve never used Urban Decay before so thought I would give this brand a whirl. So a quick visit to the Urban Decay Counter in House of Fraser and off I went with my two new purchases. So everybody knows for healthy skin we need to drink lots of water and to protect our skin from the harmful rays of the sun, so I was kind of intrigued to try the Urban Defense Complexion Primer as it had an SPF of 30 combined with the benefits of a primer which promises to smooth complexion and allow for a better application of makeup. It does this by filling in the pores and creating a poreless look, prepping the skin for the easy application of foundation or powder so that your makeup lasts all day. Directions of use state to use a liberal amount I was quite wary of doing this as I have very oily skin and can be prone to breakouts so I only use a small amount but I have found that it actually spreads out quite far. The product has a silicone like texture and glides onto the skin quite easily first impressions of this when applied to the hand is that it felt quite oily and greasy but was impressed when I applied it to my face as it sort of dissapeared into my skin and it felt weightless with no stickiness. However, I would be cautious using this product with any oil based moisturisers simply because too much oil causes breakouts and I doubt the foundation would ‘stick’ as well. I apply the primer with my fingers all over my face including my neck. This formula contains conditioning ingredients such as sesame seed extract, tomato fruit extract, squalene and bisabolol. I did however have a skin breakout a couple of days into using it but it has now cleared and I can genuinely feel a difference with my skin tone and texture a couple of weeks into using it so I am just putting that down to my skin getting used to a new product! My foundation applies over the top of it seamlessly and it stays on all day! 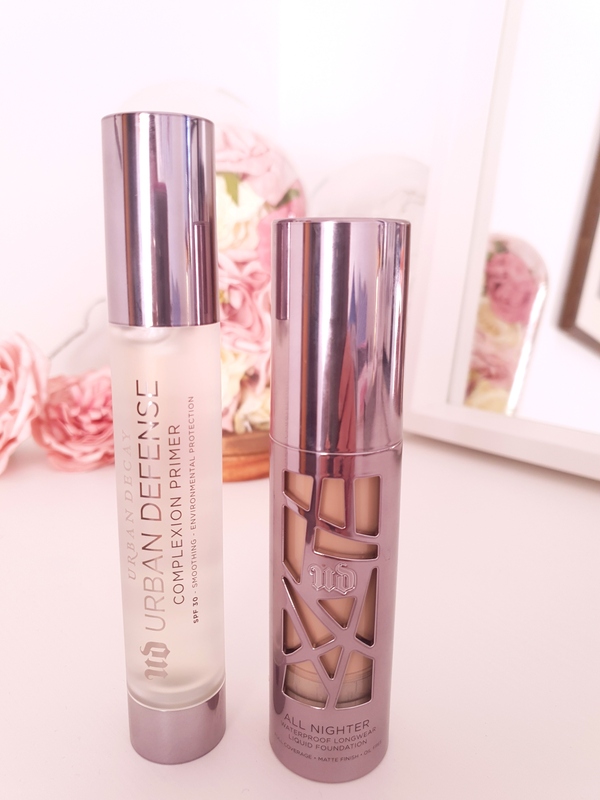 I bought this primer for £24.00 which I think is well worth the money it comes in a lovely looking bottle with a metallized gunmetal cap and base and an airless pump which means you can get every last bit of the product. BARGAIN! So this product cost £29.50 and I bought it in the shade 3.25. This shade is normally a lighter shade than I would usually go for. The sales lady did some swatching with me and I found that I was suited to more natural tones for my skin. I would definitely not risk buying this without looking at some swatches and matching them with your skin tone. The thing to watch out for with this product is that it oxidises during the course of the day hence why i bought a lighter shade. I am absolutely over the moon with this product, a little goes along way and you can use a minimal amount for a daytime look or more for a more heavier look for instance, if you are going out . Its highly pigmented so a little goes a long long way. Its paraben-free and provides full coverage all day long without the need to do any touching up. I apply this foundation with my fingers initially and dab on to my forehead, cheeks and chin and buff it out with a foundation brush this way it spreads evenly and easily across my face whilst using a smaller brush to apply to the creases and smaller areas of my face. It also claims to be sweat proof, I havn’t been able to test the sweat score out as its pretty damn cold at the moment, but if you have oily skin like me and it passes the sweat proof factor then that’s another yeaaaahhhhh to add to this product. I do have spot prone skin and some slight redness, and this foundation does hide all these flaws and doesn’t aggravate my oily skin in anyway. I’d say that a lighter application of this product would give off a more natural look whereas a heavier application would not be as natural, but it doesn’t look overly cakey like some foundations. The product felt comfortable with the lighter application but did feel quite heavy when more foundation was applied. The finish of this foundation is matte and flawless it blends in well and hides all my skin impurities. 10/10 from me !!! It comes in a super cool sleek bottle that feel luxurious and quite heavy. Its housed in a highly metallized gun metal effect bottle with an airless pump and you can see the colour of the foundation via the abstract pattern around the bottle ! Looks great on the dressing table! What primer and foundation have you used and what would you recommend . Thanks for reading if you like what you read please follow my blog and subscribe to my emails. Previous Unicorn Cosmetics. Class of 86 eye stationary set.